You Decide When to Boat & We Take Care of Everything Else! 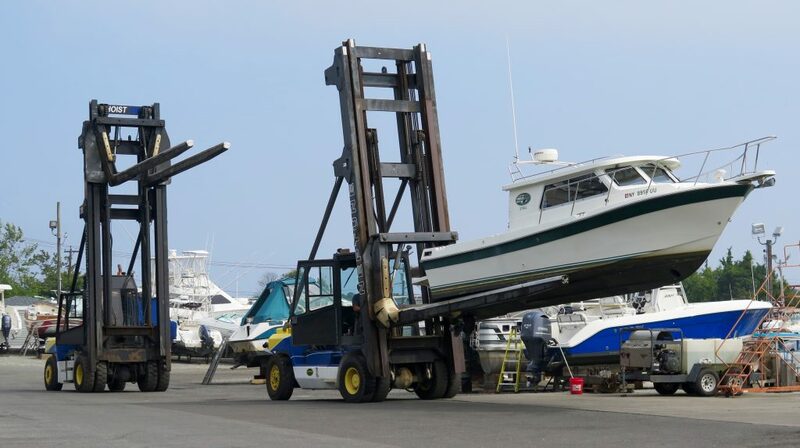 Your boat is forklifted off the Rack/Cradle (Depending on your Contract) and set In the water, Ready to Go! *Oakdale Yact High & Dry Storage Is now integrated with BoatCloud, allowing you to schedule your launch from the app with the click of a button – more convenient than ever! *Based on LOA of Boats with 8’ to 8’6” Beam, Plus Tax. Upon arrival by trailer, there is a $12.50 Per/Ft offload fee. Please be sure that your arrangements have been made with our service department preferably two weeks in advance if you will be in need of our offloading services. All high and dry boats not contracted for winter storage must be removed from premises on or before October 15. Please see Dawn if you need to make arrangements for winter storage. Any customer requesting a haul or launch after this date will be billed for that service. Winter Storage fees begin October 15th. ANY Customer who leaves their boat here past this date and does not have a signed contract on file with us will be charged for storage @ $11.00 per day. Note * If you choose to pay with a credit card you will not be taking advantage of the 3% discount and that percentage will be added to your contract / invoice.